iChemistry Solutions are the world's only reagents and consumables custom-designed to boost the performance of your mass spectrometer and improve sensitivity, productivity, and data precision. The Amplifex Diene reagent can be used to specifically derivatize any molecule with a cis-diene system. Reagent will increase signal strength by up to 1000 fold. The Amplifex Keto Reagent can be used to specifically derivatize any molecule with a keto or aldehyde functionality. This reagent will increase signal strength by up to 500-fold. The aTRAQ Reagent Kits for amino acid analysis of hydrolysates enables you to quantitate 20 amino acids from protein hydrolysate samples more than three-times faster than conventional amino acid analyzers. The aTRAQ Kits for amino acid analysis of physiological fluids enable you to quantitate 45 amino acids from physiological samples. The kits are designed for use with LC/MS/MS systems. The Automated Protein Digestion Solution can be used with the Beckman Biomek NXP Span-8 laboratory automation workstation to enzymatically digest up to 96 biological samples for LC/MS protein quantitation. CE-SDS technology from SCIEX is proven to generate results with the ultimate accuracy, sensitivity, reproducibility and flexibility. With the SCIEX CE-SDS Kit, there is no mess, no stains and no exposure to toxic materials. 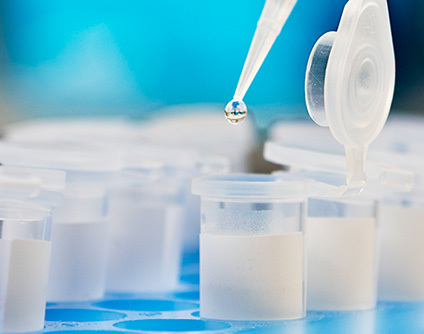 Get the reagents you need to run your experiments in one convenient assay. The Chemical Standards Kits contain reagents for calibration, tuning, and optimization for all LC/MS/MS instruments and QTRAP, Triple Quad, TripleTOF, TOF/TOF, and MALDI-TOF and QTOF Systems. The CYP450 Protein Assay - Human Induction Kit, uses an LC/mass spectrometry workflow to enable direct measurement of protein expression changes of individual CYP450 isoforms with high specificity, sensitivity, and accuracy. The iDQuant Standards Kit for Pesticide Analysis contains 206 common pesticide standards and can be used for quantifying and identifying pesticides in any sample matrix. The iTRAQ® reagents are the first set of multiplexed, amine-specific, stable isotope reagents that can label all peptides in up to eight different biological samples enabling simultaneous identification and quantitation, both relative and absolute, while retaining important PTM information. The SCIEX Lipidyzer™ Platform kits have been uniquely designed to support your lipidomics so you can achieve more accurate lipid quantitative measurements, without bias. The series of kits include an internal standards kit, which contains over 50 labeled molecular species across 13 lipid classes, as well as tuning and QC solutions developed to improve the quantitative accuracy and reproducibility of your lipidomics analyses. The mTRAQ® reagents are amine-specific, stable-isotope-labeled reagents, available in duplex or triplex format, designed for high confidence protein and peptide biomarker verification using MRM analysis on QTRAP® Systems and the Triple Quadrupole Mass Spectrometers. roQ™ QuEChERS extraction and dispersive kits are designed to make QuEChERS sample preparation for food products even easier. The SWATH® Acquisition Performance Kit is designed to assess and maintain the performance of your LC-MS system. The kit contains a mixture of synthetic peptides and digested lysate for assessing performance of your SWATH and IDA experiments.